An unexpected change in the wind or one plugged in appliance too many can see a small flicker turn into a large flame. Now that the temperature has dropped and we turn to controlled fires and electrical appliances to keep us warm, local firefighters want to make sure you don’t put yourself or your family at risk. “With winter upon us, Fire and Rescue NSW is urging residents to take every precaution to avoid a fire in the home,” Station Officer, Michael Liddle said. Simple, smart steps include turning off all electrical appliances at the powerpoint before going to bed, turning off electric blankets and heaters when you’re not at home and before getting into bed, keeping candles away from curtains and ensuring you have a working smoke alarm. 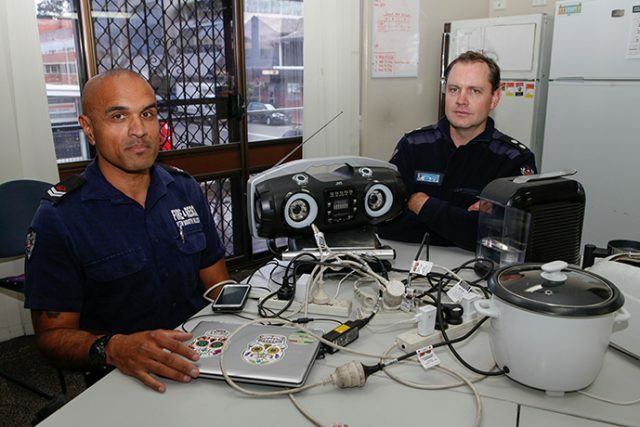 Despite fires happening all year round, winter is a time to remember the firefighters’ rhymes of ‘a metre from the heater’ and ‘keep looking when cooking’. Recently, the crew were called to a fire in a new apartment near Nepean Hospital, where a cooking fire was almost disastrous. “He was cooking chips on the stove top when the oil spurted up,” firefighter John-Paul Amputch said. The bathroom was damaged from the fire and the man was lucky to escape without serious injury. “People panic and, for a lot of people, the first instinct when they see a fire is to get water, but you can’t use water on an oil fire,” Mr Amputch said. The Penrith region was in the top 20 of the state for fires last winter, with 22 residential fires between June and August last year. But residential is just half of the fires they are called to, with businesses also guilty of not paying attention to safety procedures as overloaded powerboards continue to create electrical fires. To minimise the risk, make sure you don’t overload powerpoints and powerboards, regularly check electrical leads for damage and faults, and never use faulty electrical leads or appliances.